Clouding the Sky with Poisons! What And Why Are They Spraying In The Sky? Learn by looking into it. Protect yourselves as much as you can. also known as "Climate Engineering"
We must demand the spraying stop to reduce illness, dull brain, dementia and early death. It is MOST IMPORTANT to know what is happening to you and your family. NOT NORMAL JET "CONTRAIL" ICE! -- NOT REAL CLOUDS! What Is Atmospheric Aerosol Geo-engineering? Have you noticed the frequent presence of unusually long-lasting emission trails from airplanes stretching across the sky? These are NOT the normal but rare airplane condensation trails familiar to sky watchers for many decades. "Contrails" are made up of frozen condensation from a jet's exhaust in certain conditions. Relatively harmless contrails may occasionally extend behind a jet plane from a few times its length up to perhaps a mile or so, depending on the moisture content in the surrounding air being about 72%. Normal contrails usually occur high in the atmosphere where the air is extremely cold, and dissipate quickly, similar to the mist from your exhaling breath on a cold winter's day. However, the moisture level at that altitude is usually low, so contrails rarely occur. On the other hand, if you keep your eye on the sky on days with visibility, you will probably notice eventually a whole sector or even the whole sky full of unusually long persistent streaks of aerosols. Often you will notice the airplanes at work emitting these sprays. Some of these air tankers are piloted, and some are possibly programmed drones on autopilot. These are usually not regular commercial aircraft, but there is evidence that those are sometimes being outfitted with aerosolizing equipment and used as well. The sprays, consisting of coal fly ash, heavy metals, especially aluminum, biological agents and more, are not normally coming from the airplane's engine exhaust, although chemical agents such as sulfates are now added to fuels. The bulk of the aerosols are often sprayed from nozzles deployed on planes dedicated to the purpose of spraying. Studying these chemical sprays when they are being dispersed, we see that they cross the sky and last a long time. Often the aerosol trails crisscross each other. They gradually expand out into artificial cirrus chem-clouds, wispy odd-looking streaks, often with abnormal layering or ribbing. The spraying can be done at any time of day. Gradually a haziness coats the sky, often lingering for hours. The chemical clouds attract moisture, so various types of water vapor clouds may form from the the artificial ones, eventually increasing the haze. The dispersal of the aerosols is usually in the stratosphere above any normal clouds already present, but it is also done at lower altitudes. Once the fake clouds develop, they may look wiry or have wispy hairs, vertical ribbing or spiky edges. Again, jet condensation trails (like your breath on a cold morning) are NOT persistent and ARE RARE, so do not accept an attempt to dismiss these chemical trails as abnormally long-lasting "persistent contrails" of ice. The planners and administrators running this spraying program have operated quietly and deceptively. They have tried to keep the reality of geo-engineering aerosols from the public by labeling it a "conspiracy theory". They act like the idea is under consideration and that it may get tested at some point, even though has been done for over 20 years and gradually more heavily. The obscuring explanations originate from disinformation agents who are paid and compelled to give false info. Those behind this activity do not want a public discussion nor action to expose and stop it. The spraying of what have been popularly called "chemtrails" is intentionally hidden in plain sight by mimicking jet contrails. The sprays are obvious streaks to begin, then become obscured as the stripes fan out into a haze or blend with actual clouds. With either real or fabricated clouds in the sky it is harder to distinguish the chemical trails and the fake clouds they create. To minimize questioning about it, this disguised spraying activity is not publicized by authorities. Those in the scientific community who are aware of the controversy, are commonly prompted by the threat of ridicule or worse to claim that there is no evidence of chemical components of what they and most people assume are normal jet contrails. There are even several disinformation websites with the purpose of falsely "debunking" the exposure of geo-engineering and chemtrails. On the other hand, there are hidden documents describing this process. In fact, insider scientists have given Latin scientific names to various types of artificial clouds created by the geo-engineering aerosols. Those who are perpetrating this spraying project seek to extend as long as possible the relative lack of public attention to their doing this and the misinformation about it. NOTE: It appears that a change in policy to public acknowledgement of the possibility of aerosol spraying has been engaged in recent times, along with new disinformation that this spraying will actually be good for the planet. When mentioned, geo-engineering is framed as a future possibility being considered and tested. They do not acknowledge that the spraying has been going on for more than 20 years, or reveal that the public is suffering the health consequences of it. There is actually conclusive evidence of this aerial spraying of toxic agents, but there are few recognized scientists who have investigated. Scientists are rarely willing to risk their reputation to be mocked for investigating what is purposely labeled a "conspiracy theory" to buzz off qualified investigators. Those who are behind this unannounced spraying do their best to divert attention from it. There is little coverage in the main media of this quiet project developed in think tanks that strategize world control. If there are research grants from the elitist non-profit corporations and foundations to support this program and the analysis of it, the information is not made public. This spraying process has been introduced incrementally over more than a 20 year period to get the public gradually used to seeing the haze in the sky. In recent years they have brazenly filled the skies with X's and stripes due to the success of their subterfuge. There are rumors that some of the cartoons produced by big movie company have been remade to reflect the presence of aerosol trails, and that they have even redone sky shots in versions of some popular old movies. If this is true, is being done to make the excessive amount of trails seem normal to a mass hypnotized public. It is difficult to know all the facts when they are obscured by the sophisticated scripted false reality presented to us by powerful manipulators behind the scenes. Most institutional researchers, along with the few members of the generally gullible public who might wonder, accept the official false pronouncements by government bureaucrats and the military that these trails are normal but longer lasting "lingering contrails", as they deny that the chemical aerosols being sprayed. 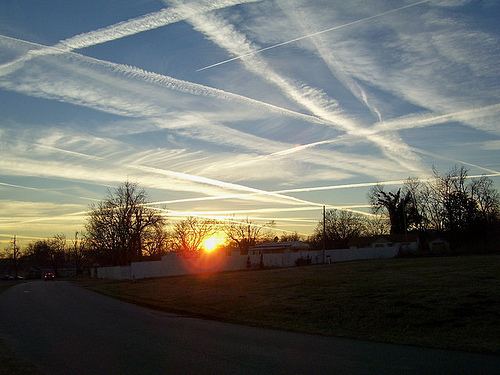 Although the nature of the vastly increased amount of trails in the skies is debated, those who dig into the subject somewhat become convinced that the official story is either due to purposefully false disinformation, or compelled ignorance on the part of officials who are uninformed or misinformed under the normal policy of restricted "need to know" in secret operations. They may also be under blackmail or threat, additional policies used by the puppet masters. In-depth research has uncovered secretive programs such as Project Cloverleaf, that require ionization of the atmosphere as done with the combination of the metals and powerful electro-magnetic generators. There are also periodic coordinated releases of massive amounts of steam from power plants across the nation, possibly laden with gases and other additives. There is evidence that similar steam production is being done by ships at sea or floating platforms. These may be complementary to the spraying of ionizing materials from airplanes. The limited number of highly compartmentalized scientists and workers that are aware of the reality and the chemical make-up of the aerosols either think that these sprays can be justified, or they are kept silent by fear of reprisal or other threats. Potential government and corporate whistleblowers are discouraged from acting, perhaps by a greater threat than simply losing their job. Is This About Global Warming? Officials, strategists and technicians with insider awareness of the spraying, when cornered, have cited "stratospheric aerosol geo-engineering" (SAG), "stratospheric aerosol injection" (SAI) or "climate engineering" for "solar radiation management" (SRM) or "solar mitigation" to reduce "global warming" or for weather improvement. This impressive sounding terminology is offered in conjunction with hyping climate change as the justification for the spraying of aerosols as well as the population being guided to reduce the "carbon footprint" of human activities. In fact, there are little-known international agreements for developed nations to pursue geo-engineering, purportedly as an environmental trade-off for their greater "carbon emissions". Further, there are contractors, patents, equipment, frequencies and strategic mixtures of substances involved. The metals sprayed in the sky are said to be placed there for reflecting away sunrays warming the Earth, "solar dimming", supposedly to cool the atmosphere. However, the perpetually renewed haze with its reduced sunlight is unhealthy for living organisms, contributing to serious vitamin D deficiency in humans and animals, deterioration and death of trees and plant life, and the extinction of thousands of species. On the other hand, the sprays are damaging the ozone layer, allowing more ultra-violet UV-B rays through, which are harmful to most living entities. Abnormal levels of extremely harmful UV-C rays are now reaching us as well. This may be contributing to some of the mass animal deaths. Geo-engineering fallout is also altering ocean currents and weather systems, causing arctic ice to soften and release methane. That could ruin the atmosphere and the planet before long. Also both the atmospheric jet stream and the Atlantic ocean Gulf Stream have moved, possibly incited on purpose, contributing to the unusual weather in the U.S. in every season, and severe winters in the UK in recent years. In any case, atmospheric aerosol geo-engineering is causing many of the symptoms of climate change that it is supposedly being done to counter. The notion that global warming is primarily caused by carbon emissions from normal human activities has been called a massive hoax by some scientists. There is an alternative understanding to the promoted story that this theory was created by elitist powers with their own motives, and initially presented using falsified data generated by controlled scientists and highlighted by public puppets. Burning hydrocarbon fuels to drive our cars, heat and power our homes and run our factories and businesses, generates pollution. Better options are available and should be pursued. However, the idea that carbon emissions from these common activities were a significant cause of global warming or "climate change" is not only debatable, it is seriously criticized by numerous credible climate scientists and meteorologists. Actually, "the powers that be" are the ones that bound us to coal, oil and natural gas use for purposes of profit and control, while suppressing free non-polluting energy alternatives (eg., Nikola Tesla's inventions), that could have been fully deployed long ago. They continue to run our society with these burnable fuels, while developing weather control technologies and destroying nature with them. Climate and weather manipulation by geo-engineering is the main reason that natural climate change cycles have been disturbed. The carbon emissions are not irrelevant, however. Now that the we are on the edge of environmental collapse due to geo-engineering we must minimize carbon dioxide production, as the few remaining trees are so toxic and weak they are not able to absorb as much of the CO2. Meanwhile, we need to learn what geo-engineering has done to our planet, and what can be done to stop it, and to restore natural balance. The chemical aerosols are officially described as being for the purpose of blocking solar radiation to ease global warming from the sun (with no mainstream media coverage). There are evidently other purposes of the spraying beyond the claim of reducing solar heating. In fact the artificial clouds may counteract any cooling they might do with the warming from the "greenhouse" blanket they form in the atmosphere. The aerosol components are also thought to be part of a sophisticated weather modification system that effects rainfall. These technologies can be used to cause either drought or rain, sometimes including severe storms and floods. In 1996 a military document was created called "Weather As a Force Multiplier: Owning the Weather in 2025". It outlined the use of aerosol layers of chemical agents from air tankers to incite and intensify storms or to create drought. The concept was developed in the 1980's and implemented at about the time this document appeared. The metals in the geo-engineering artifacts may be used in conjunction with electromagnetic rays from an "ionospheric heater". In the past these frequencies were primarily from the secretive "High-frequency Active Auroral Research Program" (HAARP) installation in Alaska. Now they may originate from smaller units of similar technologies, some of them possibly mobile. The network of frequency use includes Doppler Nexrad towers. An ionospheric heater is a virtual antenna that radiates Extremely Low Frequency (ELF) signals around the planet, even into the depths of the ocean. These include Alfven waves and Magnetosonic waves, geomagnetic pulsations among the lowest frequencies. Laser beams from satellites are also used to generate, escalate and guide storms, according to Dr. James McCanney, who helped develop the technology for use in moving severe storms away from harming society. This technology is used for electromagnetic frequency experimentation, weather and earth modification, control of the ionosphere, warfare and even mind control. Analysts consider it a geo-physical weapon. There is clear evidence of advanced methods used to grow and move hurricanes and tornadoes with rapid evaporation boilers, aerosolized metals and laser beams from satellites to target areas for destruction. They can heat the ionosphere and bounce laser beams and radio frequencies (RF) off of the metals in the sprays. Some analysts believe they are generating earthquakes on purpose as well. Nikola Tesla is reputed to have invented a device to do that on a small scale and demonstrated it in New York City in 1897. There is evidence that some of the recent California wildfires have been generated with directed energy weapons. How do homes, cars and other structures get burned to ashes with metal elements melted, while trees and shrubs survive? That is not really a forest fire. The drought out west and in many other agricultural areas, has reportedly been effected by geo-engineering. With heavy spraying of the particulate metals, moisture is aerosolized and overly nucleated, becoming a misty fog too fine and light to fall as rain. The right mix of chemical aerosols injected in the atmosphere quickly provides artificial material that breaks the moisture down to a mist and prevents rainfall. So rain can be and is being blocked from falling to generate drought in one area, while excessive rain is caused to fall in another area by high tech cloud seeding. Similarly temperatures can be manipulated with these technologies. There was an anomalous temperature split in the U.S.A. in the summer of 2017, with the central and western states excessively hot, and the eastern states abnormally cool. Yet low rainfall was experienced in most of the nation. Some think these conditions were created. Similarly, the significant repositioning of the jet stream is connected with the "polar vortex" winter storms and cold temperatures reaching deeply into southern states that have not normally had such weather and are not well-prepared. Hurricanes and tornadoes are also subject to artificial manipulation that can build a super storm. In addition to contaminating soil, water and living things with the toxic metals, the geo-engineering sprays, HAARP and other deployed beaming towers and satellites, may be altering the magnetic field. Meanwhile it is harming the ionosphere and fostering climate changes that increase methane release into the atmosphere. The geo-engineering that has been done so far has caused a greenhouse feedback loop, increasing warming in crucial areas, while perhaps accelerating the oncoming mini-ice age. The softening of the north polar ice caused by geo-engineering results in the release of methane, which, according to scientist Dane Wigington, is 100 times a greater problem than any other carbon emissions are. As the environment deteriorates, vast numbers of people may die from starvation, disease dementia or worse. The methane release being caused by geo-engineering could make Earth uninhabitable in a few short years if not stopped. There is a concern it could lead to a life-ending burn off of the atmosphere by exploding methane. The metal salts of silver iodide, aluminum, barium, strontium, thorium, cadmium and manganese, some of them radioactive; the sulfur dioxide (maker of "acid rain"), sulfur hexafluoride, ethylene dibromide, plastic fibers and micro-crystals; and the BIOLOGICAL SUBSTANCES, the mycoplasma, mold and fungal spores, algae, bacteria, blood cells and insect eggs; that are being released in the geo-engineering aerosols, are nearly all harmful to humans, animals and plants. We are breathing and swallowing these health damaging substances WITHOUT OUR CONSENT. There is a real concern that geo-engineering serves a role in a planned depopulation program. Click here for a video interview with two investigators with a lot of information on the alarming levels of poisons with which we are being attacked. You may have already experienced "chemtrail flu". As the environment deteriorates, vast numbers of people may die from disease, starvation or worse. The changes being caused by geo-engineering could make Earth uninhabitable in a few short years if not stopped. Learn to identify the sky spraying, weird clouds and chemical haze so you can recognize and better understand what is going on above and around you that is effecting your health and well-being. You will likely want to spend little time outdoors at times of heavy spraying or precipitation. On the other hand, restrict time in hot sunlight as well. Share this information with others to build momentum for correcting this severely damaging covered-up activity. The scripted narrative of blaming carbon emissions from human activities as the reason for climate change, and labeling this as a great threat to the planet, serves as a justification for the geo-engineering. Based on this fabricated propaganda, the controllers have been getting the public used to the idea of population reduction, one of their main objectives. They raise up the faulty old Malthusian theory of overpopulation as further justification for mass genocide. Planned projects serving this agenda include public poisons and frequencies that reduce fertility and shorten life, expanded abortion, pestilence, starvation, weather disasters, terror events and wars. The dis-informational use of terms such as "conspiracy theory" and "climate change denier" are floated by think tank planners deep state agencies and controlled media as memes to confuse the public and foster oppositional beliefs. These terms were concocted for mind control purposes. Divide and rule memes rely on cognitive dissonance (resistance to a concept triggered by its sharp difference from one's assumed reality). The normalcy bias (expecting normal to continue like it has been) and confirmation bias (conformity to the collective narrative of media and associates) cause people to ignore alternative views. The appeal of acceptance by agreement with a group sharing a strongly believed collective story can lead to dogmatic fervor as in a cult. A charismatic leader of such a group may be able to raise commitment to a mission to the point that some people resort to excessive behavior. The anthropocentric climate change debate needs to calm down from the ridiculous rhetoric about jailing as criminals or executing those who are skeptical of this constructed false controversy. Very few of the critics of this global agenda deny that the climate is changing. It changes all the time. Why it is happening seems most likely to be due to both natural earth changes, primarily the relation of our planet interacting with the sun and other bodies, and geo-engineering. Geo-engineering is being falsely presented as a solution to what it actually causes! Have we heard about the ongoing aerosol spraying in the mainstream media? Rather, we hear pitch after pitch blaming normal life activities of an excessive population for climate change. There are also attacks on those who question the carbon footprint agenda, blasting them with dismissive labels and even vicious ideas of abuse and harm. There have been an astounding number of key personnel involved in various secret programs killed in "accidents" or by reported but unlikely suicide. Perhaps their usefulness to the system of the manipulators was subsiding, and/or there was a concern about their exposing something unfavorable to cabal interests. Those who are behind the spraying and the false narratives also control the media as well as businesses and research institutions involved in this and related projects. A few years back Al Gore planted disinformation about geo-engineering in a TV appearance with Ellen Degeneris. He stated that it is something being "considered", as though it had not been going on for 20 years already. Now, as more people have become aware, officials are openly talking about the aerosol injection option as they seek to reposition their story to explain the streaks in the sky as new and experimental. Gore's pre-arranged "award winning" propaganda movie, "An Inconvenient Truth", targeted toward those with environmental concerns, employs faulty details and disinformation scripted for him to present. The intent was to further the elite agenda of global control, while bolstering the cover story of human activities causing the problem. Meanwhile they have quietly harmed us and the planet with their multi-purpose geo-engineering program. We must not let the fraudulent games of finance, politics and war, and the divide, conquer and rule strategies involved, cloud our perception of reality. I have observed these unusual aerosol trails and phony clouds in the sky repeatedly for many years. I also spent a lot of time watching the sky as a kid. I am certain of the difference of what is now in the air from the clear blue skies of the 1950's. At one time I had three different domain names on the internet trying to reach people with earlier versions of this information. That was a little much to manage, so I moved the information to this page. The aerosol trails are sprayed in local skies every few days at any time of day or evening, and even at night. More and more observers are pointing them out all over North America as well as in many other parts of the world, particularly developed areas. Sometimes I have seen three and four airplanes working at once. They usually travel gradually back and forth across many miles. The timing of the aerosol releases is probably controlled by a computer programmed for appropriate locations and conditions. We are not near enough to an airport for the amount of air traffic leaving trails at the times they are most prolific to be routine passenger flights. It is thought that the spray planes are commonly operated on autopilot. Many of them may be drones, though there are piloted craft as well. There is evidence that increasingly, normal commercial aircraft are also being outfitted with the spraying nozzles and loaded with tanks of geo-engineering solution to contribute to the spraying. The sprays form a lattice work of streaky trails that expand to appear as wispy fake clouds and haze. Sometimes the resulting formations look like cotton candy, or there may be a white or gray haze. These artificially created clouds are often unusual and quite distinct from real clouds. When the clouds have ripples and ruffles in them, it is believed they are reflecting electromagnetic waves or other frequencies from ionospheric heater transmissions, lasers, radar or satellite beams. When you realize that these fake clouds are artificial, they are NOT pretty or cool, even when illuminated by the setting sun. I became more aware of "chemtrails" a number of years ago with reading and listening on talk radio to find what various people have to say about them. Aware people have been tracking these for quite a while. IMPORTANT NOTE: There are indications in some recently uncovered documents that there is now a technology to disperse the aerosol sprays WITHOUT LEAVING A VISIBLE TRAIL. Just when the public is waking up to this bizarre activity, they apparently intend to hide it completely. Earth's environment is in grave danger from the poisons of stratospheric aerosol geo-engineering, aka "chemtrails", and the methane that this process is causing to be released into our atmosphere. Hundreds of species are going extinct, soils are being poisoned, important soil microbes are being killed, trees are dying in great numbers, wildlife is diminishing and the Earth may become a dead planet. The toxic particles in the aerosols are nano-sized and will penetrate through the lungs and travel throughout the body. These are thought to be contributing to a worsening of degenerative disease, including cancers, respiratory illness, allergies, Alzheimer's and much more. Animals are being effected with tumors, respiratory illness and odd behavior as well. Aluminum causes short term memory loss, and eventually dementia and Alzheimer's disease. Barium has negative effects on breathing, heart rhythm, blood pressure. It can cause stomach irritation, muscle weakness, impaired reflexes, Parkinson's, Multiple Sclerosis, brain swelling and deficiency, enlarged liver, and damage to the kidney and heart. Migraines, autism, respiratory problems, infertility, cancer, coronary disease and other chronic illnesses are also thought to be engendered or worsened by the geo-engineering chemicals. Strange fibers, sometimes in web-like form, developing on many surfaces are being connected to the aerosols. Even worse, biological matter has been found mixed in with these fibers. Some of this has been identified to be insect eggs, at least some of which have been genetically altered, as well as bacteria, molds, algae and fungal spores, and even red blood cells. These may have also been modified genetically. Many gardeners and farmers are saying that their plants are not able to produce good results after an accumulation of the toxins falling from the aerosols in the sky, especially the aluminum. These metal salts also alkalize the soil. Aluminum blocks nutrient uptake and is starving plants as well as trees, similar to plants that are victims of drought. Further, aluminum taken in by the tree makes them much more susceptible to burning readily and at a much higher temperature in a forest fire. Many trees and wild plants are suffering from the effects of geo-engineering. Huge numbers of trees in many areas have abnormal amounts of lichen and other fungal growth on them, often in addition to impaired development of leaves and fruit as well as loosening bark. Worse, whole sections of forests are dying. The proliferation of lichen, a symbiotic combination of fungus and algae that grows on trees, as well as other fungi and molds, may be increased by the seeding of fungal spores and algae in the sprays. We are breathing this stuff! Some people are allergic to molds, fungi and algae, and these may contribute to Morgellon's syndrome. (See the disturbing info on Morgellon's further below). Further, some analysts think the methane released as a result of geo-engineering may cause Earth to become as hot as Venus in a few years, killing us humans and nearly all life on this planet. 200 species per day are being driven to extinction, most of them in the ocean, which is being acidified by the methane and other pollutants as well as radiated from Fukushima. Many of those who are concerned about the pronounced global cooling of the last dozen years or so, think we may be rapidly moving into a new mini ice age. In any case, climate change has become more pronounced in recent years, and the manipulation of the atmosphere by this hidden program may be making the situation much worse. The interference of geo-engineering is keeping scientists and meteorologists from being able to determine what the weather and climate would be without it. Click here for a crucial interview with Dane Wigington, leading expert on the geo-engineering crisis. Some children have made a video to try to get more adults to awaken to this issue: click here to watch. A major issue of our time is pollution and destruction of the ecosystem, including the expanding introduction of Genetically Modified Organisms, (GMOs) in the U.S. and other locations. There appears to be a connection between the push for life-destroying genetically modified crops and stratospheric aerosol geo-engineering. The poisoning from aluminum and other toxic metals in geo-engineering aerosols falling to the ground in rain are starving and dehydrating trees and plants, including agricultural crops. Geo-engineering is a primary tool in weather modification methods, including both drought and heavy rains. Strangely, the producers of genetically engineered organism (GMO) seeds have developed some crop strains that are resistant to aluminum interfering with growth, as well as drought resistant strains. Click here for more about GMOs. Most aware of this spraying activity presume it is being done for protection from the sun and "global warming", perhaps in a trade-off as part of global environmental agreements, others are aware they may be used for weather control as well. Such "stratospheric geo-engineering" is discussed at world level conferences on the environment as an alternative trade-off in industrialized nations, done instead of reducing of carbon emissions. Many investigators, including very credible scientists, are convinced that the false issue of excessive carbon emissions because of too many humans has been created and promoted by the powers that be as a major tool in their global control scheme. Some think the HAARP project might have been using the conductive metals in the aerosols as a weather modification tool or as a space age defense weapon. It is also speculated that this advanced technology system may be used to create droughts, storms and earthquakes on purpose. There is speculation about much more severe secret potential uses of ionospheric heaters, lasers and other advanced technologies. The fostering of conditions that destroy or limit farmers' crop production can create profits from commodities futures trading and crop insurance contracts, and at the same time force farmers to turn to genetically modified crops designed to be resistant to drought and aluminum contamination. Many farmers are being squeezed out of business due to crop losses. Their land may then be bought up by giant agribusiness corporations who pursue the GMO model. Since government officials lie about many things, and do not publicly acknowledge the spraying, it is not certain what the real purpose of geo-engineering is, or if there are multiple purposes. It may lead to greater starvation as food is becoming harder to grow due to drought and the chemical contamination of the soils. Pollution particles are known to stabilize clouds and reduce rain. The fogginess in the sky created by geo-engineering sprays is a mix of the sprayed chemicals and accumulated moisture. This haze reduces sunlight, which authorities may claim is for countering global warming by solar radiation. Most analysts considering geo-engineering believe that the toxic metals and polymers that have been found to be dispersed are either for climate and weather control through cloud seeding, and/or for electromagnetic transmissions, possibly to create droughts and/or storms, to stimulate earthquakes, to poison people for gradual population reduction, and/or as part of secret high-tech weapon/surveillance systems. Power plants and other ground sites and specially prepared ocean ships set up for spraying, generate massive water mist on demand, adding to the artificial cloud formation. Strategically placed Doppler Nexrad radar towers are utilized in moving and intensifying weather systems with frequency generation used in conjunction with the metals in the chemtrail aerosols. The military has been developing weather warfare techniques for more than 50 years. The geo-engineering chemtrail spays are a key part of that. The intent has been to create and control weather conditions thought to include: temperature extremes, rainfall, droughts, storms, tornadoes, hurricanes, floods, forest fires, volcanic activity, earthquakes and tsunamis. I first heard about chemtrails back in the late 1990's. I was skeptical of this and other "conspiracy theories" at first. However, being open-minded, inquisitive, and suspicious of "The Establishment" since the Viet Nam War era and the Agent Orange and other chemicals they sprayed there, I have looked into geo-engineering considerably. For over 40 years I have investigated the conspiracies related to foods (giant food and chemical corporations, USDA, FDA), medicines (Big Pharma, AMA, FDA), economics (giant corporations, FED, IRS, IMF, World Bank, AID), law (statutory law and circumvention of the Constitution), and more. More and more people are becoming aware that there is a world wide technocratic tyranny that has been developing for centuries. Powerful interests have collaborated for a very long time to form an unofficial organization that is behind most of what happens in the "civilized" world, including the operation of governments and economies. They have planned and executed a drive for control similar to the ways of the conquerors and tyrants of old, and the megalomaniac villains in movies such as the James Bond films. The powers behind this global corporate organization have an elitist attitude, vast wealth, a sophisticated organization and advanced knowledge and technologies. They do not reveal the full details of their plans and operations to the public, although they have an interesting practice of presenting hints of their intentions in their controlled media. Most people do not want to believe that "The Powers That Be" are conducting unannounced operations that could be harmful to the population. However, for some reason they have been increasingly spraying chemicals regularly in our skies for well more than 20 years, while poisoning us in many other ways for over a century. Geo-engineering aerosols and GMOs may also be used to transform nature and undermine the health and well-being of the population. Analysis of aluminum levels in northern California's Mt. Shasta area showed a pond water reading of 12,000 ug/l (micrograms per liter) of aluminum. The normal level considered safe is just .5 ug/l. Chemtrails have increased the level by 24,000 times, leaving the water highly toxic. The presence of aluminum in a snowdrift at 8,000 feet on Mt. Shasta is 61,100 ug/l, 122,200 times normal. Readings in other locations have shown similar outrageous levels of aluminum. Trees, plants, crops, wildlife are all being impaired or dying. With reduced sunlight, molds, fungi and microbes multiply, hastening the damage to crops, the decay of trees and the illness of animals and people. Meanwhile, biotech companies are rolling out GMO crops and trees that can grow in toxic metal laden soils, but which do not reproduce. Thus the corporate system may be eliminating natural species to replace them with plants and trees owned by the corporations that can survive their chemical techno war. You are probably aware that various governments, including our own, have off-budget secret experimental programs for development of weapons and other technologies of control. What is harder to understand is why a government, or agents that it sanctions, would engage in activities harmful to its own citizens. It is clear that chemical abuse of the population by government agencies and large corporations has been happening for at least a century. Chlorine and fluoride are poisons that are added to nearly all public water supplies. Toxic chemicals, including aspartame, MSG, preservatives, flavors, colors, pesticides and others are laced into the food supply. Chemically grown foods, genetically altered foods, irradiated foods, white flour paste, sugar and corn syrup, trans fats, "junk foods", nutrient deficient foods, meats and dairy foods with steroid and antibiotic residues, aspartame, etc., all these unhealthful food products offered by the corporate giants contribute to the epidemic of degenerative diseases. When someone gets ill from the toxic stress and poor nutrition, poisonous chemical drugs are all that are permitted to be officially prescribed as "medicines". Soon natural alternatives may be eliminated from availability or greatly reduced in efficacy under the Codex Alimentarius regulations developed in Europe and being promoted for international adoption by the U.N. and its global governance agencies. This policy would put serious restrictions on many natural health supplements. Beyond pollution of food, water and air, the electromagnetic frequencies (EMF) of satellite and cell phone transmissions, the new "smart meters" being installed at homes by electric utilities, and other electronic pollution, can be thought of as a growing giant experiment on all of us with potentially grave biological consequences. Toxic vaccinations are introduced at a level beyond all reason to infants, many of whom are severely impacted, and also to military recruits. Parents need to learn the truth about what awful effects medicines have on children and young adults. The unknowing public is repeatedly victimized in the annual push for flu shots, which are also best avoided. It is especially crucial right now to get educated about the harms of vaccines, as there is a major push to make them MANDATORY FOR EVERYONE, as biologically engineered viruses are being tested in conjunction with bureaucratic protocols for dealing with pandemic. Vaccines can be used as tools of depopulation by seeding plagues or viruses programmed for timed demise of the host. There is a long history of government experimenting with people without their knowledge, for example in developing and testing vaccines, as well as nuclear and biological weapons. Experimentation with such weapons and other military technologies has brought illness, sometimes death, to many thousands, without any acknowledgement of cause by a secret testing process. There have been a number of chemical and biological weapons tests conducted on populations in various locations in the U.S. before deployment in war scenarios. For example, after testing dioxin on prisoners in Pennsylvania, thousands of young American men and millions of Vietnamese people were subjected to Agent Orange dioxin, in the 1960's and 70's. The suffering and death has been horrendous. Now this nasty poison is being reintroduced as an agri-chem herbicide. The government has routinely subjected its enlisted military personnel to "harm's way" beyond the guns and bombs. Among the first to get a new vaccine are those in the military. Exposure to unusual chemicals and biologicals has destroyed the health of many soldiers as well as local civilians, often resulting in early death (eg., Agent Orange in Viet Nam, "Gulf War Syndrome", depleted uranium in Iraq and Afghanistan). Over the years I have learned from various sources that the secret off-budget agencies and "black ops" have hidden technologies that are so far beyond what the public is allowed to know, that we would be astonished to learn of these. What Is The Real Purpose Of the Geo-Engineering Aerosols? It seems bizarre to think that a government would cause or allow massive amounts of toxic metals, strange polymers and altered microbes, to be rained down on the entire population. There is evidence that global powers want to greatly reduce the population of the planet. But after all, politicians, generals, top bureaucrats, big bankers, upper executives, wealthy power brokers and others in control -- all of them live on this planet too! Do they have some kind of antidote or protection from the fallout when they are out and about? I assume that they stay primarily inside controlled environments, and the very highest among them live in one of the few areas where chemtrails are not sprayed. Aluminum is known to cause or worsen Alzheimer's disease, dementia. Fluoride is known to cause apathy and lower IQ. Many people have learned to remove it from their drinking water, so now it is in the air. Strontium is carcinogenic, and tends to settle in the bones. What are the hidden controllers up to, and why is it not being revealed to the people? Are they trying to counteract harmful solar effects from the known weakening of the Earth's magnetic shield? The magnetic poles have been rapidly shifting for the last few years and the shield has diminished significantly. The term "Solar Shield" is associated with the roll-out of the new public campaign to justify the chemtrails. They refer to them as something new, while they have been incrementally spraying for over 20 years. There are numerous military uses of the geo-engineering. It is advantageous for military ops to have the atmosphere ionized. It is said by some analysts that these sprays are a part of secret advanced technological systems that may be able to conduct surveillance, facilitate communications, form a defensive shield, and/or create droughts, destructive storms and floods, as well as earthquakes. There is also speculation about high tech mind or behavior control involving HAARP or the nanobots in tthe aerosols or both. Some investigators believe the corporate controllers are using these technologies for nefarious purposes, such as generating severe weather conditions, stressing people's health, "dumbing" us down for multi-faceted manipulation and gradual reduction of the population. In summary, geo-engineering is seemingly used for multiple purposes: modification of the atmosphere, weather and environment and other earth changes, weather warfare military actions, and possibly biological manipulation and weakening of the people. Some watchdogs argue that the elitist powers behind the scenes are poisoning the people with aluminum, barium, GMO's, fluoride, aspartame and other chemicals in the food and water supplies to dumb down, weaken, control and eliminate population. Meanwhile these public poisons drive people to the elitists medical establishment for more profits in the process. Analysis has found unusually high levels of molds, algae and fungi as well as other microbes, and even human red blood cells in the aerosols. The fiber material may serve in part as a delivery mechanism for the biologicals. More and more people are becoming allergic to molds, fungi and other airborne biological substances, as immune systems weaken from the many abuses and inadequate vitamin D.
Are these caused by high tech GMO insect eggs, DNA, fungal spores, algae, or even newly synthesized biological entities in the sprays we're breathing? A few investigators have even said they believe engineered items, nanobots (submicron "smart dust"), may be included in these chemtrail aerosol sprays. Are they attempting to turn us into "transhuman" robots? Analysis by independent scientists suggests that there are nano-crystal semiconductors surrounded by an organic shell that are being delivered into our bodies to replicate highly engineered devices that are designed to change us into some type of hybrid human robots. Microscopic crystals, many shaped like hexagons and pyramids, are present in the mix. These may be the tiny brains that guide the replication of the fibers and other strange high tech items that they are putting into us. The presence of these miniature devices inside us may make us susceptible to the effects of frequencies and communications to manipulate and control us more than they have been able to do already with television, fluoride, vaccinations, aspartame, electromagnetic fields, HAARP transmissions, etc. It may be possible with these technologies, in conjunction with broadcast capability like HAARP, to stress and disturb people mentally, or even deliver messages directly to our brains. The "smart dust" may be even programmed to alter our DNA. There may be a synthetic nucleic acid called "GNA", or other genetically modified agents in these devices for such a purpose. The sea of extremely high electromagnetic frequencies that we are being subjected to from cell phones, transmission towers, wi-fi, HAARP, Doppler Nexrad radar, etc., may be partnering with the nanobots inside us as part of a coordinated strategy to harm or transform us. There have also been dried self-replicating red blood cells found in the aerosols that cannot be destroyed! What are those created to do? What we are experiencing may be called "transhumanism", a newer term for eugenics. Through unavoidable technological manipulation we average people could be tracked, weakened, subdued, manipulated, killed or transformed into something else, perhaps programmable, task-oriented, asexual, unemotional, even keel, biological robots. What is possibly being created is an intelligent field of "smart dust" that we live and breathe in, controlled through electromagnetic frequencies. Just as a cell phone is reached by the frequency assigned to the phone's particular number, and how a wireless computer is connected to the web and identifiable by frequency, you and everything about you could be known and controlled through frequencies interacting with the programmable microchips inside you, which you have breathed in or swallowed. I know some of this seems way beyond the fringe, but tests have shown these substances in the geo-engineering fallout. Much of what the powers that be are up to is difficult to discern because those that are doing it do not reveal anything about it directly to us. Other Theories Consider UFO's, ET's and/or "Planet X"
Beyond the purposes of weather modification and poisoning of plants and population, another theory about geo-engineering is that "the powers that be" are trying to block our view of the increasing number of UFO's being reported in the skies in recent years. Although the elite and their controlled media have for nearly 70 years used ridicule to characterize those who claim to witness UFO's and extraterrestrial entities as wacko, the evidence is overwhelming that there is a presence of advanced technology craft and other intelligent species active on and around our planet. There are serious reports that extraterrestrials have been observing us, if not actually controlling us all along, and further, that the elitist powers of Earth have had mutual relations with ET's for a long time. Perhaps the advanced tech they are using to manipulate and control us has been developed with extraterrestrial input or from back-engineering discovered ET technologies. It is also speculated that the power cabal and their associates with top secret capabilities had formed plans many years ago for a fake laser-show like "alien invasion" as one of their scenarios to manipulate the population into accepting a new one world government. Another theory is that a "Planet X" is thought to be approaching Earth as it is purported to do periodically on a very long cycle. Some analysts think the cycle duration is 3600 years, others say it is longer, perhaps 13,000 or 26,000 years. There are indications of such a celestial visitor in ancient writings. A few investigators believe it comes through more often, perhaps every 360 years, but is only occasionally severely destructive, depending on how close it comes to us. The aerosol sprays may be both covering up and contributing to a different unpublicized mass devastation event. An additional and growing theory of climate and weather disturbances is that a large celestial body is coming through our solar system. This "Planet X" hypothesis is in part based on detailed descriptions of such a long cycle visitor on several occasions in historic writings, including the time of the flood that Noah survived. This celestial body is said to be almost undetectable until it gets near. Most of those researching say it is approaching now. They believe its influence may already be effecting the sun and Earth, contributing to the dramatic weather and increased earthquake and volcanic activity we are seeing. There is a concern that the effects could be much worse as Planet X come closer, including destruction by meteors hitting Earth from the debris field that would travel with such a body. Or there may be an approaching field of asteroids, meteors and frequencies rather than a large body. Another concern is that the sun is expanding or emitting more radiation, possibly in reaction to a nearing large hidden planet or group of bodies. Some Planet X analysts suggest that there is likely a dwarf dark star in binary relationship to our sun, with which Planet X may be related. If a brown dwarf star is also coming near, the radiation given off by it could be harmful to life. Some think the spraying of metal salts in the atmosphere may be done to reduce the harm to life on the planet from the increased radiation or other effects of one or both suns. There has been an unusual spike of ultra-violet UV-C rays recently, that are far more harmful than UV-A or UV-B. In any case, those in control are thought to be withholding information about solar system disturbances, either to avoid chaotic panic by the population, or to maximize population reduction if there are major earth changes. In my opinion, the research suggests that chemical abuse and/or biotech modification of life on earth are very likely among the hidden purposes of the aerosol attack on us all. It is not simply about "climate change". The geo-engineering issue needs to be widely discussed, with honest investigation to get to the truth about this bizarre unpublicized process. If this is all new to you, it is time to learn more. This is near the top of the most important issues we are dealing with at this time in human experience. The aerosol sprays are in the skies. What are they? What are they doing to our health, our weather and the viability of our crops, trees and wildlife? Are we in the process of being transformed into some kind of robotic cyborgs without our knowledge or permission? What else is being kept from the public that could have a direct serious impact on the life of everyone of us? 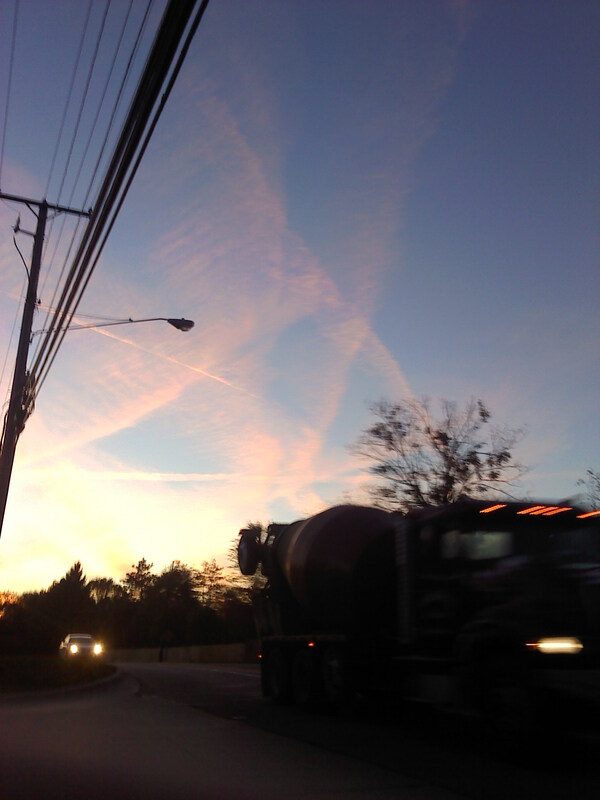 We need to let everyone know how to recognize the geo-engineering trails. With millions of us watching the skies and reporting any news here and on other websites, we may get the momentum going to get truthful answers from the government and/or the powers behind the the scenes that are perpetrating this strange abuse of the planet and the population. The harmful poisons and the methane being released by geo-engineering are threatening the continuation of life. The byproducts of weather manipulation and warfare has gotten out of hand, and could result in crop devastation, food shortages and mass starvation and death. We must work together to stop these harmful actions as soon as possible or the planet may become rapidly uninhabitable. Some think that the natural weather systems have been so disrupted by now that ALL clouds and rain must be manufactured to have any, and that ALL the weather is artificial. Is that how the National Weather Service forecasts are projecting so far in advance? Click here to hear Jon's internet radio broadcasts on geo-engineering chemtrails. I invite you to help find out what is going on with geo-engineering. Check out the articles, photos and videos linked below. This page should remain open for making additional selections. Click here for video presentations of the recent Chemtrails/Geoengineering Awareness Conference in San Francisco. Click here for an analysis of the climate change controversy. Click here for photos of geo-engineering sprays, then click on pictures and other links for more info. Click here for a powerful article on geo-engineering aerosols, including many convincing photos. 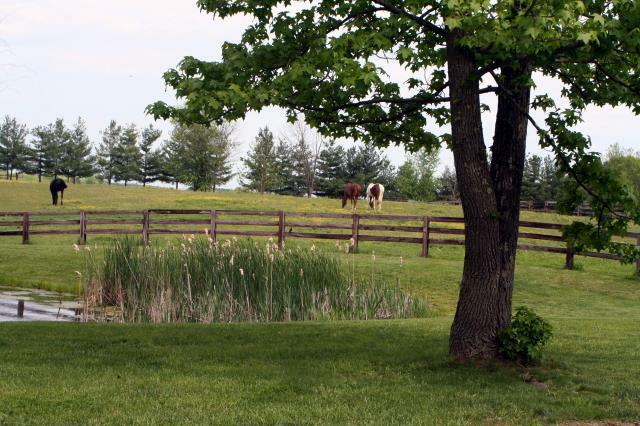 Click here for a website describing the trails in various locations. Click here for Truthstream Media's short video showing chemtrails being sprayed. Click here for a Colorado Fox TV Channel's news reporting on chemtrails. Click here for another video description of geo-engineering chemtrails. Click here for a video study of multiple trails sprayed at once. Click here for a video of a FedEx cargo airplane's near collision with secretly operating Air Force geo-engineering planes. Click here for an eye opening article on chemtrails and the powers behind their use. Click here for a video of chemtrail sprays in England, including comparison to jet contrails. Click here for a breakdown of the substances found to be in the aerosols and their effects. Click here for a video interview of two geo-engineering investigators sharing much information and alarming facts about the poisons with which we are being attacked. Click here for an article on "Chemtrail Flu" citing public health expert, Dr. Len Horowitz. Click here for a Discovery Channel segment on chemtrails. Click here for an overview of Michael Murphy's documentary, "What In The World Are They Spraying?" Click here for the full documentary, "What In The World Are They Spraying?" Click here for the trailer of Michael Murphy's important sequel documentary in the series, "Why In The World Are They Spraying?" Click here for the full powerful documentary, "Why In The World Are They Spraying?" Click here, for a crucial interview with Dane Wigington, leading expert on geo-engineering. Click here for the important website GeoengineeringWatch.org. Click here for a list of U.S. Weather Modification patents. Click here for the Air Force document "Weather as a Force Multiplier: Owning the Weather in 2025". Click here for information on coal fly ash used in geoengineering sprays. Click here, for a video about Earth becoming rapidly like Venus, too hot to be inhabitable, due to geo-engineering and HAARP. Click here for an excellent presentation on the undisclosed synthetic biology experiment. Click here to watch an intro video about HAARP. Click here to learn more about the High-Frequency Active Auroral Research Program (HAARP). Click here to watch a disturbing video about HAARP. Click here for an important article with a comprehensive database on geo-engineering and HAARP. Click here for another valuable resource web page on chemtrails and HAARP associated with the movie Thrive. Click here for a video on weather warfare and its likely use in Texas. Click here for a description of the work of a chemtrail activist and how she has been harassed by surveillance personnel. Click here for the website of the Coalition Against Geoengineering. Click here for the ClimateViewer.com geoengineering page. Please visit the sites linked above to read more or watch when you have time. Once you know what to look for, watch your skies and report what you see. Send us your descriptions and photos, including your location. Take action to help expose and end this universal poisoning. ~ Wear a high quality mask and cover all skin when outdoors on chemtrail days. ~ Designate footwear for indoor only and outdoor only use. ~ Remove outdoor footwear at the door. ~ Designate outer garments for indoor and outdoor only wear. ~ Remove garments exposed to outdoor air at the door. Click Here to order powerful respiratory, detox and antioxidant products. Click Here to order health building flaxseed, wheat germ and/or greens. Click Here for info on preparing for the coming changes. Click Here for info on removing fluoride & chlorine from your water.